Pet Owners will do anything to keep their pet healthy but sometimes necessary procedures and medications are too costly for up front payment. How does your office handle these situations? Do you set up automated payment plans to cover the cost of pet care? Do you use a third-party financing company? PaymentBanc is an alternative to 3rd party financing for expensive veterinary procedures. 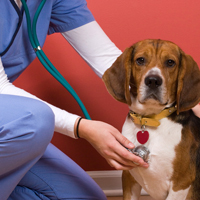 PaymentBanc gives veterinarians the ability to have an in-office payment plan without creating extra work for your staff. We also give you the ability to know the pet owner's credit risk before you extend veterinary payment options. Step 1: Determine Credit Risk – PaymentBanc gives veterinary clinics the option of running quick, simple credit checks. These will not affect your customer’s credit score while they give valuable information to determine payment plans. You get a letter grade risk level not a credit report, making it possible for anyone to take the correct action on each customer. Step 2: Offer Payment Terms – Once an office decides to offer payment terms, PaymentBanc will completely manage that account. Payments are drafted directly from the pet owner’s checking account or credit card and deposited into the veterinary clinic's bank account each month. If the payment fails for any reason, PaymentBanc contacts the responsible party and schedules a follow-up draft. They can even print receipts directly from PaymentBanc’s secure website. PaymentBanc helps veterinary clinic staff spend less time managing payments and more time managing their other office duties. Our system helps you tailor a payment solution for each of your customers based on their ability to pay, and we handle all aspects of those payments. Contact us today at 888-758-0583 to learn more. We have a client who came up with an 'A' rating (which means she probably can pay for her pets services in a variety of ways) who told us she scheduled her dogs TTA surgery with us because we offered a payment plan. Not only did we get a client we might not have had, but this client will also give us some great free advertising. ©2002 - 2019 All Rights Reserved | PaymentBanc© is a registered trademark of OrthoBanc, LLC. All other tradmarks are the property of their respective owners.